3D printing is one of top ten promising advances in recent technology. In fact, 3D printer was first developed in the United States by a company named 3D SYSTEMS. However, it has recently gained widespread attention because of the broad range of materials that can be used. In the early stages, 3D printer was limited to plastic but these days, materials such as metal, glass, paper, and polylatic acid(PLA) can also be used. This diversification made it possible to use 3D printers in many different areas such as the medical, construction, and textile industries. The principle of 3D-printer is based on that of the general printer and the concepts of differential and integral calculus. First, the desired product is shaped and cut from a solid that is very thin like a differential, and then pieces high from the bottom to the top are piled up like in integral calculus. After repeating the process, the pieces are glued together from adhesives shot from the head of the printer. After the final piece is printed out, the finished product is soaked into a hardener to quicken the drying process. Once it is completely dry, the result is a product that perfectly matches the blueprint. To use 3D printing, special programs like AUTO CAD are needed. This program can be easily used by the general public to make designs for 3D printing. However, safety standards need to be discussed, particularly in the medical field, as there are potential problems regarding possible ethical and social side effects. For instance, in the future, people will have easy access to artificial organs and can easily duplicate prescription pills. Because of the readily available nature of technology these days, education is crucial and stronger regulations are needed. popularization. In fact, currently printers are too expensive for the average person to purchase. The retail price for a useful, everyday 3D-printer is approximately three thousand dollars, which is equivalent to about four million won, which is a bit costly. Shin So-yeon, a Junior in the Department of Industrial Management of Engineering, who also attended a 3D printer class, said, “We mainly received education regarding the theory of 3D printing. The class lacked practice due to a lack of equipment. This is understandable as 3D printers cost a fortune and it would be financially difficult to provide enough machines for an entire class.” Also, the 3D printers used in domestic households can only use plastic. The 3D printers that are widely distributed are unable to make products with materials such as metal or glass. Using plastic at home can be detrimental for one’s health as it can typically contain many elements that are harmful to humans. Environmentally friendly materials are being developed but at in the very early stages. And thus, there is still a long way to go. Wide range usage of 3D printers has been accompanied by problems of misuse. Accoring to the survey by the Hanyang Journal(The HJ) involving 150 Hanyangians, over 50 percent of respondents were worried about the abuse of 3D printers regarding its possible danger. The biggest problem is that of 3D printed guns. In fact, such guns were used by terrorists in Hong Kong who caused serious injuries. This is a real life example as to how 3D printers can negatively affect society. There are also inevitable problems relating to the copyright of designs. Imitation can be prevented with technology like Digital Rights Management(DRM). However, when producers apply the DRM system to a product, they have to pay various fees for things like licensing and market access. This gives 3D printing less room to grow and interferes with the creative process. In the movie Mission: Impossible Ⅳ (2011), the main character, Ethan Hunt, makes an artificial mask to perform a mission using a 3D printer. There are many makers involved with 3D printing such as 3D-printer ink developers, 3D printing fashion designers, and even a 3D printer chef. One-person manufacturing is becoming a reality. According to Professor Kim, the nature of manufacturing will be transformed into a coexistence of the mass production of standardized goods and the small production of customized goods. 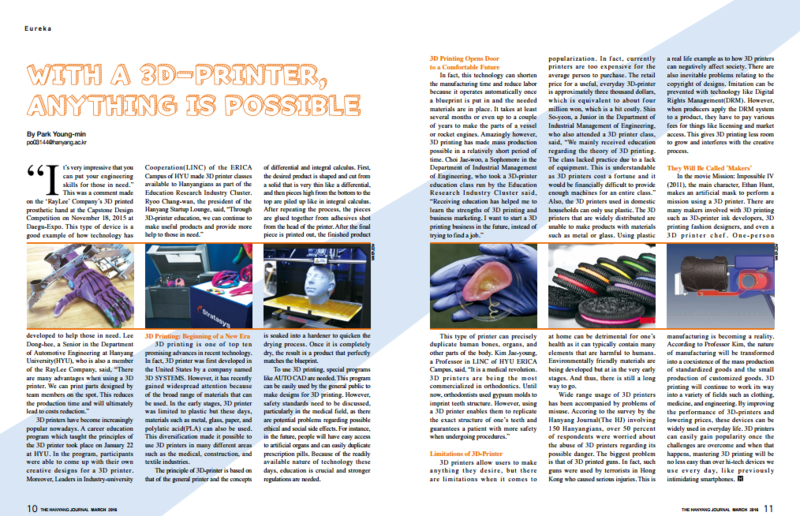 3D printing will continue to work its way into a variety of fields such as clothing, medicine, and engineering. By improving the performance of 3D-printers and lowering prices, these devices can be widely used in everyday life. 3D printers can easily gain popularity once the challenges are overcome and when that happens, mastering 3D printing will be no less easy than over hi-tech devices we use every day, like previously intimidating smartphones.